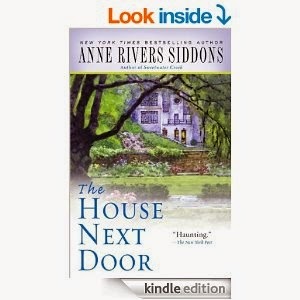 The House Next Door from Anne Rivers Siddons was a book recommended to me last summer by one of my online "mom" groups. I have to say, the beginning of the book seemed fairly solid. I enjoyed the general plot line, and the first half of the book (approximately) was a decent read. I was able to get through it at a steady pace, and was enjoying the book. Then, about midway through, things took a turn for the worse, and the book went downhill fast. I did not enjoy the ending (I thought it was rushed and lacking), and it just seemed kind of to run out of steam. The characters never really went anywhere over the course of the book, and they all seemed very one-dimensional, especially everyone outside of the main focus of the book. The basic premise is of a moderately wealthy couple who has a "haunted" house built next door, and the terror of what their neighbors experience. However, if you like books about haunted houses, it is a decent read. It is easy to get through, hard to put down, and will keep you reading. I would say it is a good book to read when you are relaxing on vacation. A Payday credit is immaterial, transient credits expected to manage a borrower's expenses until their next payday. These are respect paying immaterial admiration to a repulsive credit record, yet oblige that you are used, have an in number occupation and they must be repaid inside 14-30 days general.